After some time keeping louhans, hobbyists usually find themselves asking if they would like to try flowerhorn breeding. Contrary to the notion that flowerhorn breeding is hard, the truth is it's quite simple if you have prepared well for it. In this article, I will discuss some of the flowerhorn breeding tips to prepare your fish for the main mating day. 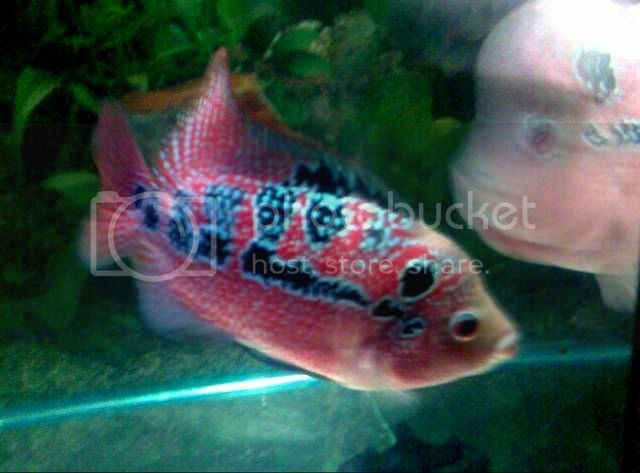 To start with, you need to have a couple of healthy matured male and female flowerhorns. You would want to choose an attractive couple. If you cannot afford to buy high quality matured breeders, you could purchase younger ones at lesser amounts and wait for them to mature. Time virtually flies when rearing these fishes so you won't really have to wait that long. Louhans usually starts mating when they reach 1 year old. Needless to say, the male breeder should have a large kok, preferrably from a strain known for having water head genes. Some females sport nuchal humps. If you get a hold of some of these rare females, consider yourself blessed. The secret to a large and successful louhan breeding program is preparation. Both the male and female louhans must be beefed up separately. To do this, slowly increase the amount of food you feed them. Or feed the pair with the same amount every time, but do it more often. Be sure to do water change more often than your usual routine during this period your breeders will surely be excreting more waste. Do the conditioning phase for at least two weeks. Some breeders take up to six weeks preconditioning their breeders before they are introduced to each other. After two weeks, you may now keep the pair together in a large tank, minimum of 50 gallons, but make sure to put a glass or clear acrylic divider in between them. Flowerhorn breeding is one of the most exciting part of this hobby. I wish you all the luck with your breeding project! Enjoy!